There’s a lot of mystery around game…hunting it, preparing it, cooking it. It’s all a little bit impenetrable for urban dwellers like me. Despite being essentially a city boy, I’ve cooked with game of various types for many years, but I’ve never really had much hands on experience with it, never shot or trapped anything, let alone prepared or dressed the kill. I still haven’t shot anything, although I most certainly would (note to self: another blog post in that statement, right there! ), but at least I’ve learned plenty more about handling game, thanks to a few hours in the company of David Lishman, top-notch butcher and the staff of the Ilkley Moor Vaults pub and restaurant. David (@Butcher_Dlish on twitter) runs a staggeringly good butcher’s shop in Ilkley, with a counter packed full of some of the best meats the North has to offer. Lishman’s pork and black pudding sausages are something to behold, and anybody who complains about not having enough time to cook needs to get hold of half a dozen or so of their steak pies for the freezer. Lishman’s sell plenty of game, and this short course was intended as an introduction, with guidance on how to deal with it, start to finish, from plucking, through the removal of the guts, to cooking and eating it. Now, I’ve done a few of these types of thing before, and my big complaint is that too often they’re not hands on enough. Sure, its great watching a chef knock out a couple of easy pasta dishes, but I want to make the pasta myself. There are no such problems on a Lishman’s event – hands on, it most certainly was. Bloody, stinking hands, covered in feathers and various bits of pheasant gunk. We started by plucking a couple of boxes of various game birds – pheasant, ducks, snape, woodcock and the like, plus a rabbit and – wait for it – a squirrel. Now, the rabbit seemed easy. The skin just slipped off, like taking off a coat, but the squirrel was more of a problem, and needed a bit of brute force and some tugging and stretching before giving up it’s coat. This post makes it look simple, but notice that, even though that fella has clearly skinned a thousand squirrels, he still needs to put his back into doing it, so you’re in good company, Mr. Lishman. Plucking game birds is quite therapeutic, although I can’t claim to be good at it. 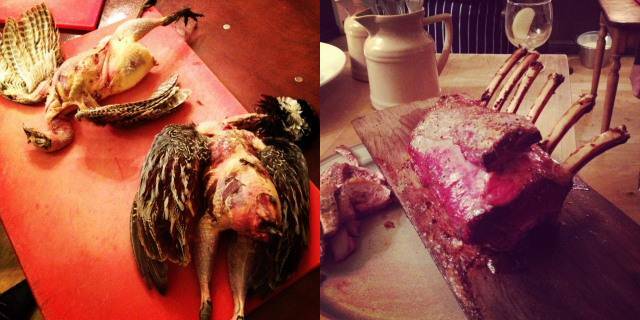 My poor bird’s skin was featherless, but in tatters by the time I’d finished, a not uncommon sight, I was kindly told. Next, we cleaned and prepared the birds, removing the wings and gutting each one under David’s expert guidance, ending up with a dressed bird of the type you’d buy in a butcher. It’s this whole process that’s missing from most people’s experience of dealing with meat and poultry of all types, and I learned a huge amount from listening to a professional talk about it, somebody who understood what he was doing and, more importantly, why. We were left with a huge range of game, all neatly dressed (well, ‘neatly dressed’ in our eyes, anyway). Time to eat some of it. A couple of pheasants had been cooked outside on what I can only describe as the Rolls Royce of barbecues, a stately ceramic affair that costs a small fortune, but on the evidence of the pheasant I tasted from it, might just be worth it. Each of the birds was cooked in a slightly different way, one on a hardwood board, and the other with some hickory chips, both methods intended to flavour it. The meat was indescribably good, soft and tender, with more moisture than any barbecued meat I’ve ever tasted before, with the wood smoke adding a superb seasoning, almost a subtle spicing to the meat. Those barbecues are a lot, but still, those pheasants were incredible, as was the rack of venison cooked in much the same way. Each of the game birds, the rabbit and the squirrel had been simply pan-fried so that we could taste one against the other. The game birds were great, earthy and complex, but the squirrel was the one I was really interested in tasting. It was like a milder version of rabbit, not at all dissimilar, but pared down a notch or two. Perfectly tasty and very easy to cook. We should buy more of it, there’s plenty of them about, after all. Lishman’s run a charcuterie course in a similar vein, and David brought along one of the venison salamis he’s been experimenting with. It was rich and smooth, melting in the mouth with a beautifully balanced flavour, quite the match for anything I’ve ever had on the Continent, and made in the heart of Yorkshire. Quite staggering, and I’ll be picking one of those up next time I’m in Ilkley, so make sure you make plenty, eh, David? I said at the start that the evening was very hands-on, and it didn’t stop at that. Next up, we learnt how to stuff a sausage, with a filling of simply seasoned venison. It’s harder than it looks, and linking the damn thing into proper bunches of sausages may take a bit more practice, but I think I got the gist of it and went away with a very handsome clutch of sausages that I could quite legitimately claim to have made myself. The evening finished in the restaurant, with a tasting of the venison sausages we’d made alongside one of the pheasant dishes from the Ilkley Moor Vault’s menu, a duo of pan-fried breast with confit leg. Both were very good indeed. Evenings like this are made or broken by the host, and in David Lishman and the staff of the Ilkley Moor Vaults, you’ve got people who are passionate about what they do and know their business inside out. The evening was supposed to finish at about half eight, but we finally left at about eleven, after an absorbing and thoroughly recommended experience. Love the post! We are very fortunate indeed to have a butchers as fine as Lishmans on our doorstep (I’m in Horsforth) and I think I might have to get involved in the game course and very probably the chartcuterie one as well! My fiance has an uncle that shoots regularly over Wigan way and every now and then he brings us something. Last time was a brace of woodcock. I had to do the de-feathering, it wasn’t pretty! Worth it though as he promised they were good eating and they didn’t disappoint. Best bit, the guts fried in butter and brandy and then chopped up into a pate for toast. Magnificent! You’re right about game though, people don’t know what to do with it, which is a shame as it’s really easy and really good value. Your nephew was sent out with the dogs once to collect pheasants at a shoot, his Father-in-law’s dog misbehaving and being useless. Your nephew, aged about 9, found one of the pheasants still alive. He says he wrung its neck by remembering the how-to-do-it in The Dangerous Book for Boys. I’m not sure such a chapter exists. More likely he takes after you, Dangerous Uncle! I live in Leeds but work in Ilkley. As much I abhore the travel time, Lishman’s makes it all worth it. Great blog too, been interested in doing something like this for a while!